Kirby using his signature Inhale, both of which made their debut in Kirby's Dream Land. Kirby and King Dedede both debuted in this game. Kirby's Inhale and Star Spit attack come from this game. King Dedede's dash attack, forward smash, Inhale, and Super Dedede Jump come from this game. 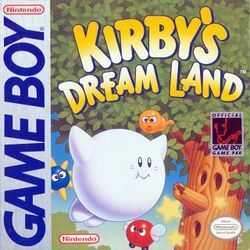 Dream Land in SSB and Green Greens are both based off of the first level in the game, Green Greens. Dream Land in SSB4 is based off of various levels in the game. Warp Stars are used to get to new areas in the game. The Apples from the Green Greens stage in Melee are also used to defeat Whispy Woods, the first boss of the game. The Superspicy Curry appears as an item in Super Smash Bros. Brawl and Super Smash Bros. for Nintendo 3DS / Wii U. Also, the Maxim Tomato appears as an item in four games. Waddle Dee, Parasol Waddle Dee, Waddle Doo, Gordo, Bronto Burt and Shotzo all appear as enemies in Smash Run in Super Smash Bros. for Nintendo 3DS. Whispy Woods appear on the stages Dream Land in Super Smash Bros., Super Smash Bros. Melee and Super Smash Bros. for Nintendo 3DS/ Wii U, and Green Greens in Super Smash Bros. Melee and Super Smash Bros. Brawl. Kirby and King Dedede's gray alternate costumes are based on how they appeared in this game. Kirby's up taunt is the Kirby Dance, which first appeared in this game. His victory poses are also variations of the Kirby Dance. Additionally, Kirby and King Dedede's victory themes are a cover of the "Level Completed" music. Meta Knight has the same victory theme, but it is played in heavy-metal and in electric guitars.